Patna Tops In 4G Coverage; 80% Of Top 20 Cities Can Now Access 4G! Patna has now India’s most comprehensive 4G availability, even better than developed and economically stronger cities such as Bengaluru, Chennai & Hyderabad. 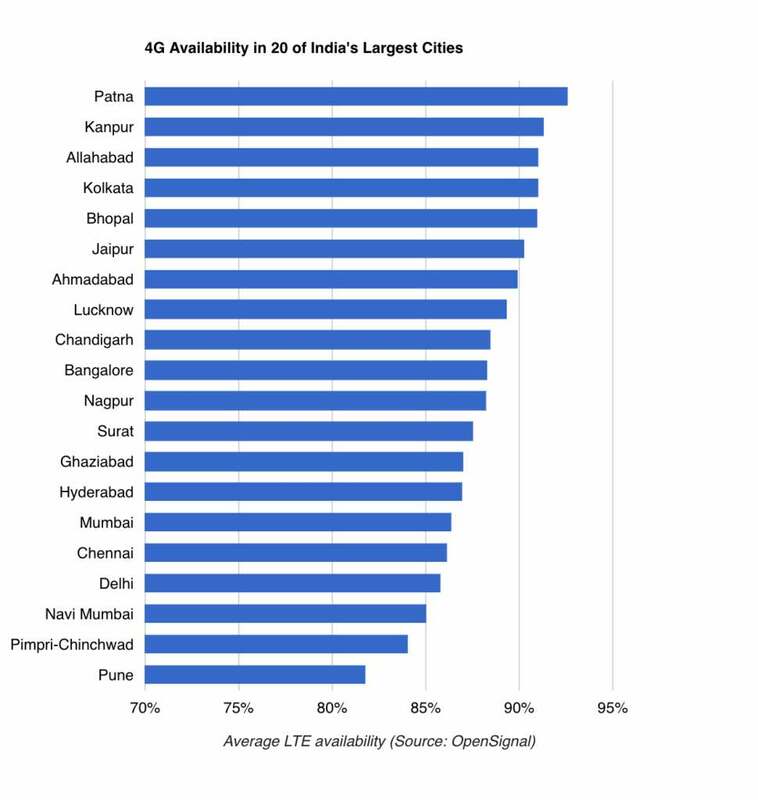 OpenSignal has released their latest report on the expansion and availability of 4G across India, and there are some major surprises here – some of them seem unbelievable, to say the least. Bihar’s capital Patna has beaten cities like Mumbai, Delhi, Bengaluru and Chennai in 4G availability. In fact, Patna has the best 4G coverage and availability, compared to all other cities of the country. Patna: 4G Hub Of India! But now, OpenSignal’s latest report on 4G availability has surprised everyone. As per the latest findings of the report, Patna has now India’s most comprehensive 4G availability, even better than developed and economically stronger cities such as Bengaluru, Chennai and Hyderabad. At #2 is Kanpur, Uttar Pradesh’s 2nd biggest city after Lucknow. At #3 is Allahabad, again a city from UP where Kumbh Mela will be organized next year. Hence top 3 positions in this list have been acquired by cities of North India. This report was prepared after analysing and researching 4G availability across 20 of India’s largest cities, for the 90 days starting from December 1st, 2017. In the top 10 are 6 cities from North and East India: Patna, Kanpur, Allahabad, Kolkata, Bhopal and Lucknow. Gap Between North & South Diminishes – 4G Is Now Everywhere! As per the report, 80% of the 20 cities surveyed for the report had easy access to 4G coverage, which means that 4G is now becoming a norm. In fact, the gap between 1st ranked city: Patna and 10th ranked city: Bengaluru is just 4.3%. While Patna has 92.6% 4G availability, Bengaluru has 88.3%. As per OpenSignal’s last report on the 4G speed, there exists a major gap between North and South India; and between urban and rural locations. But again, this gap is also filling up, as 4G availability and coverage expand at an incredible pace. "Patna Beats Mumbai, Delhi In 4G Coverage; 80% Of Top 20 Cities Can Now Access 4G! ", 5 out of 5 based on 1 ratings. Is BSNL Launching 4G VoLTE Services Across India?